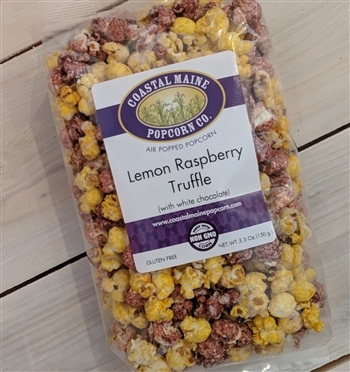 Lemon and Raspberry flavored popcorn with a white chocolate drizzle covering...enough said! Popcorn contains: Air popped corn, sugar, corn syrup, canola oil, vinegar, salt, acid sodium pyrophosphate, redried starch, baking soda, natural and/or artificial flavors & colors. May contain unpopped corn kernels. Allergen: Soy Lecithin. White Chocolate contains: Sugar, partially hydrogenated palm kernel and cottonseed oils, nonfat dry milk, milk, glyceryl lacto esters of fatty acids, soy lecithin (an emulsifier), salt, artificial flavor. Chocolate made in a facility that also processes peanuts.